Today, we are pleased to announce 10 new data transformation and connectivity features that have been requested by customers. These updates are available as part of an Office 365 subscription. If you are an Office 365 subscriber, find out how to get these latest updates. If you have Excel 2010 or Excel 2013, you can take advantage of these updates by downloading the latest Power Query for Excel add-in. 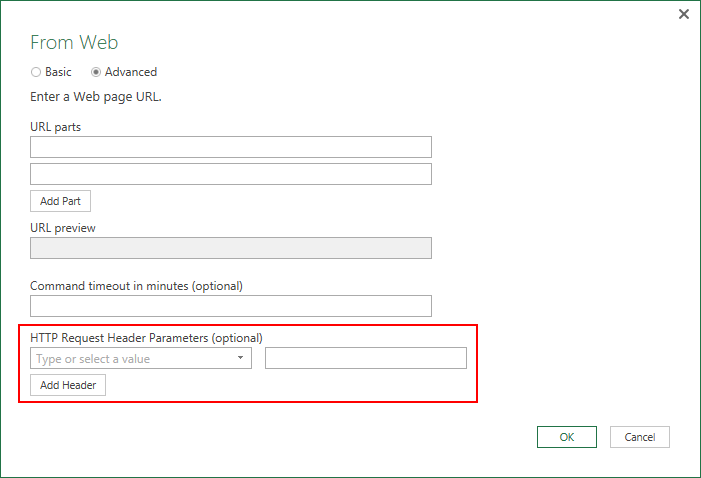 With this update, we have added support for specifying HTTP Request Headers within the Web connector dialog. Users can specify header name/value pairs from the Advanced mode in this dialog. In this update, we have added relationship detection support for OData V4 feeds. 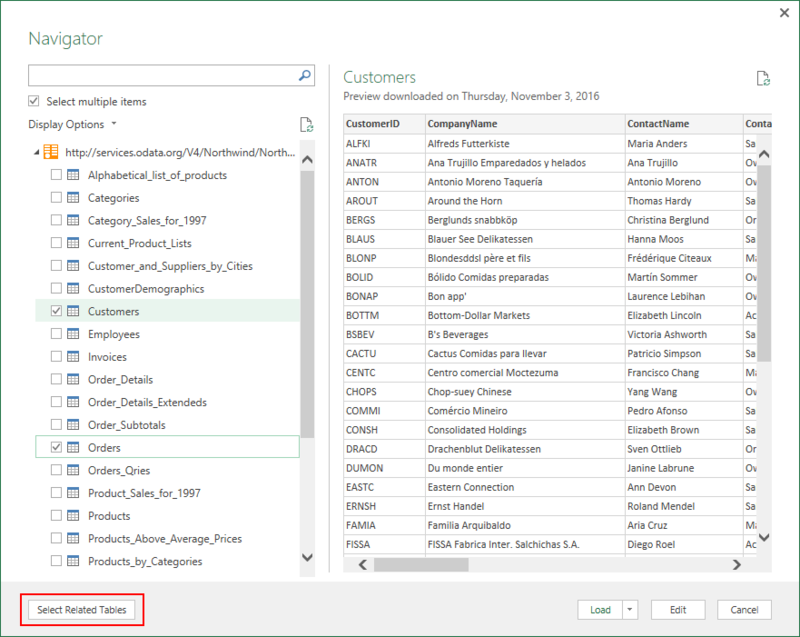 When connecting to OData V4 feeds, users will be able to use the Select Related Tables button in the Navigator dialog to help you easily select all the tables needed for your reports. We significantly improved the performance for previewing tables in the Navigator dialog when connecting to Oracle databases. In most cases, previews should take up to 30 percent less time to display than before. Support for typing values, in addition to selecting values from the drop-down list. Member ID and Member Caption are now exposed within the drop-down list. Users can leverage the Search box to search across both Member ID and Member Caption fields. 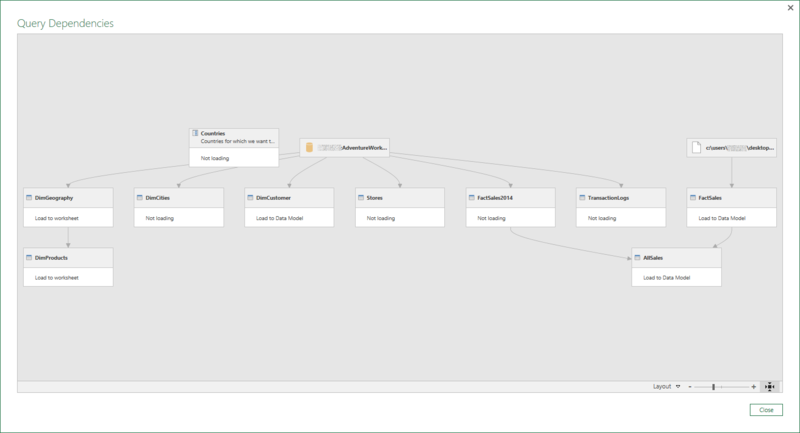 One of the most popular requests in the Data preparation area for the past several months has been having the ability to easily understand dependencies across all queries in a given workbook. In this month’s release, we added a Query Dependencies view in the Query Editor (under the View tab on the ribbon) that allows users to see all queries and dependencies on other queries or data sources at a glance—as well as an indicator of their Load status. We added Query Editor ribbon support for common operations when dealing with scalar-type queries. This includes new Contextual Ribbon tabs that expose common transformations for Text, Date/Time and Number values. A common scenario when working with custom functions is invoking such function over each row in a table. Before this update, users had to create custom columns and manually type an M expression to invoke a custom function with the right set of arguments. With this update, we made it seamless for users to invoke a custom function over a table. Users can now simply leverage the new Invoke Custom Function operation from the Add Column tab on the ribbon. 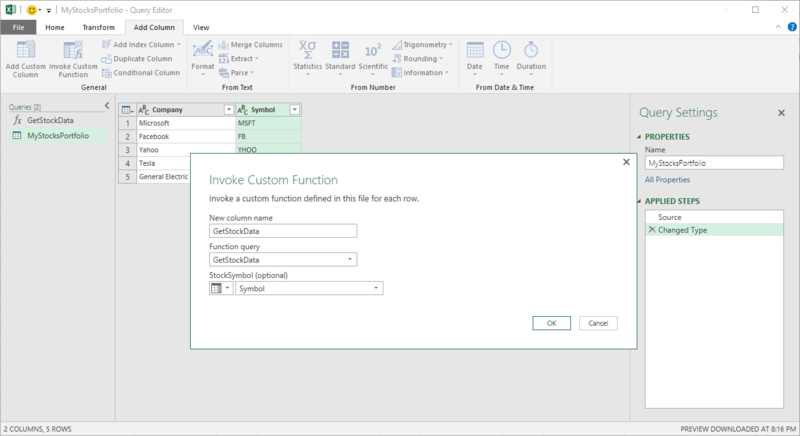 This dialog gives you the option to pick one of the custom functions defined in the current workbook and specify input arguments, which may include static values or references to other columns in the current table query. When dealing with columns with nested data structures, such as Records or Tables, it is a common that all nested structures do not have the same schema. Excel leverages schema detection to provide information such as the list of nested columns in the Expand & Aggregate column experiences. Before this update, Excel would only look at the top few rows of nested data to construct the list of columns to display. With this update, we have added the Load More option to the Expand & Aggregate columns list in Query Editor so that users can tell Excel to look at more rows to detect additional nested fields/columns. 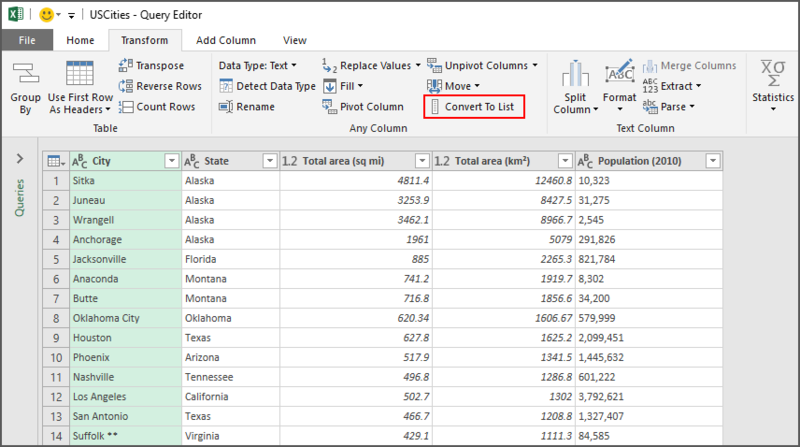 When using the Load More option, Excel scans up to the top 1,000 rows of nested data to calculate the list of columns to display in the Expand & Aggregate columns list. With this update, we made it much easier for users to turn a given column within a table into a list. 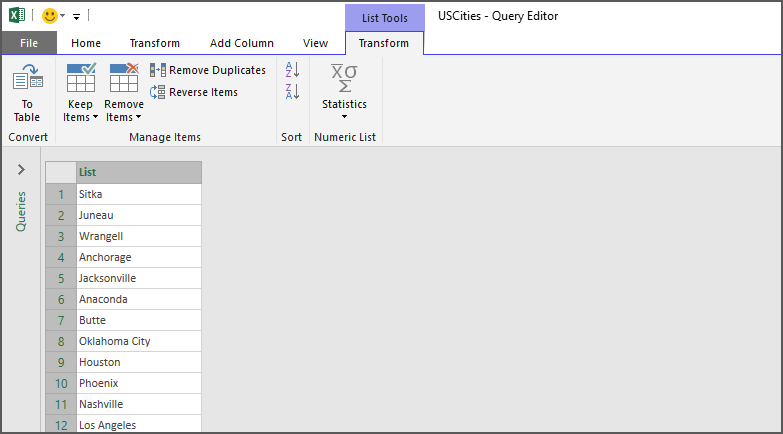 Simply select the column in the Query Editor Preview and use the newly added Convert to List button in the Transform tab on the ribbon. The output lists can be further transformed by using the contextual Lists Tools ribbon tab to perform common operations (such as Remove Duplicates, Sort, Perform Statistic Calculations, etc.). 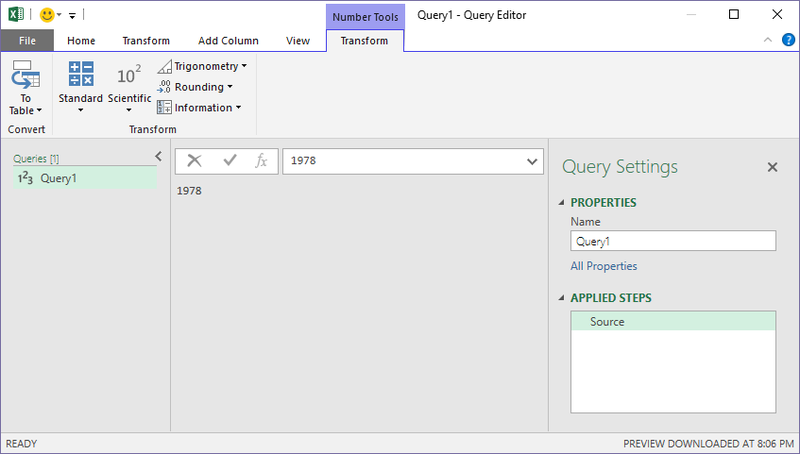 List Queries can also be used as input for the Accepted Values property in Query Parameters. With this update, we considerably improved the navigation and selection interactions within drop-down menus with the addition of select-as-you-type capabilities. This allows users to type one or more characters and these will get matched with the prefix of drop-down menu items. This behavior is now available in all Get & Transform drop-down menus, but it is particularly useful for menus with many list items (such as the Change Type with Locale dialog or the single-value parameter lists for SAP HANA, etc.). Join our Excel community on Facebook and Twitter, and collaborate with others on Get & Transform data at our new Tech Community forum.